On the board's agenda | US has been added to your bookmarks. On the board's agenda | US has been removed from your bookmarks. Deloitte Center for Board Effectiveness is pleased to introduce "On the board’s agenda," a new bi-monthly publication focused on topics that are top-of-mind for board members. Shareholders will be voting in many director elections during the 2016 proxy season, doubtlessly including some proxy contests as well as "routine" elections in which the only candidates are those nominated by the companies. Regardless of the nature of these 2016 elections, companies, investors, and regulators collectively recognize the importance of having an effective board of directors, and ever-greater emphasis is being placed on board structure, board composition, and board refreshment by all three groups. Board composition is one of the most critical areas of focus for the board, and if done properly, may be a strategic differentiator. Having the right mix of people who bring diverse perspectives, business and professional experiences, and skills, can provide a foundation for robust dialogue, informed advice, and input in the boardroom. However, beyond the defined and traditional need of varied skills and experience needed in the boardroom, a mix of behavioral patterns defined through personality traits that weigh into director interactions with each other and management can also be important considerations, as they greatly impact the effectiveness of the board. Interacting with diverse personalities comes with the territory, but how directors interact with those personalities often means the difference between collegial and respectful interactions or clashes of opinions that stifle creative thinking, resulting in an ineffective board. Deloitte’s Business Chemistry framework was designed to help identify distinct patterns of behavior that can be used to enhance individual interactions, and may help harness a more effective board dynamic. The use of a skills matrix was described in the January 2016 Edition of On the board's agenda, “Board composition: Greater than the sum of its parts,” as one way to help determine the skills and other qualities needed in new directors. A skills matrix is not, however, a determinant of whether a board will be greater than the sum of its parts–whether the individual members of the board will effectively work as a group. To date, there are few standards to evaluate these intangible qualities. There are clues, however, to identifying preferences in business, which can help to assess whether and how a board member will relate better to others. The Business Chemistry framework that employs a data-driven approach to measure observable, business-relevant traits may be used to identify the current composition of board personality traits and how that mix influences current interactions, while at the same time potentially identifying gaps in certain traits, which could then be filled through the board refreshment process. 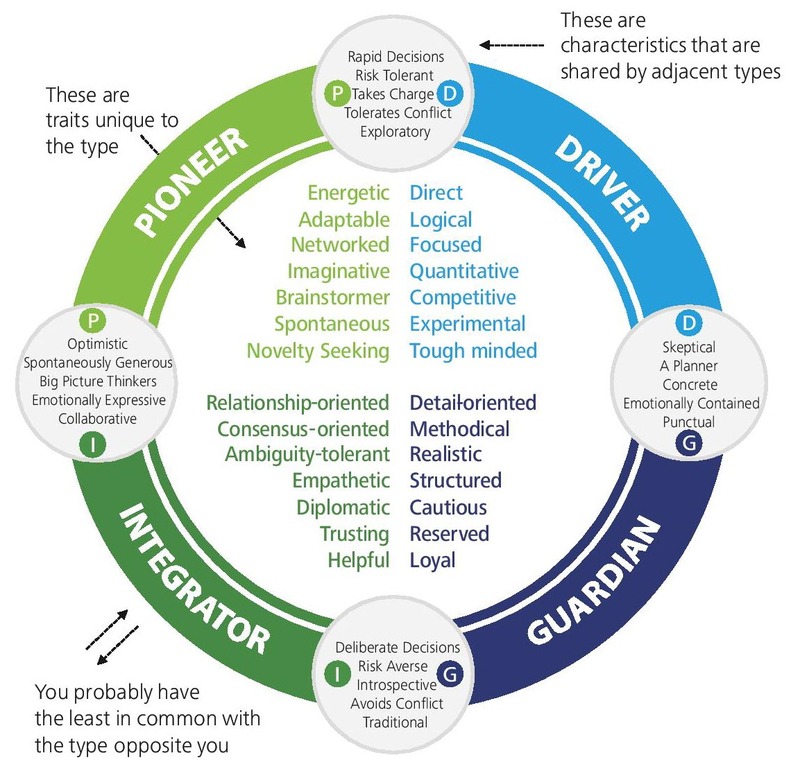 Teaming with scientists from the fields of neuro-anthropology and genetics to draw upon analytics technologies to reveal four scientifically based patterns of behavior and temperament, Deloitte has developed a data-driven Business Chemistry framework that focuses on acknowledging diverse business styles. This framework can help board members recognize behavioral patterns both in themselves, as well as other board members and, perhaps most important, prospective directors. Is there a board member who desires a large amount of detail before making a decision? Do your committee members prefer to debate versus making a decision? Is there a board member who has little affection for small talk yet is not afraid to ruffle feathers of other board members? These are questions that could help in recognizing dominant business styles of board members, gain insights as to how to hold more productive board meetings, and create a more effective board. The Business Chemistry framework can be applied to help board members recognize their own behavioral traits, as well as preferences and styles of others, by observing their business-relevant characteristics and focusing on improving the effectiveness of interaction in the boardroom through the existing board dynamics. Business Chemistry can be used by the leaders of the board and its committees, as well as by board members generally. The model identifies the unique characteristics each individual brings to a relationship, including likes and dislikes. Drivers like logic and systems, and have a laser focus on the end goal. They are direct, quantitative, competitive, and logical. Drivers are not consensus seekers, and do not like indecisiveness. Pioneers like variety, possibilities, and generating new ideas. They can make decisions quickly, but can change their minds, as they have a high tolerance for risk. Pioneers do not like process, details, and repetition. Integrators like personal connections and seeing how things fit together. They are relationship- and consensus-oriented, diplomatic, and trusting. Integrators do not like confrontation, competition, or aloofness. Guardians like concrete details and stability–they trust what is tried and true. They are methodical, structured, reserved, loyal, and cautious. Guardians do not like tardiness, disorder, or being rushed. While everyone displays a combination of traits from the four Business Chemistry patterns, many individuals align closely with one or two of the patterns. Understanding one's own business personality as well as those of other board members may result in each member interacting more effectively as each becomes aware of the unique characteristics he or she brings to the situation. Some boards may find that they have a majority of one or two of the Business Chemistry patterns, as individuals are drawn to, and often identify with, others of their own type. Others may find a nice blend of the four patterns, but have more conflict than collegiality in board discussions. This leads to the question: How does this apply to individual boards and the board leadership structure? Determine your own individual Business Chemistry composition. Identify yourself from the descriptions above and consider your interactions with differing primary types. Using clues from your interaction with board members, understand the preferences of those with whom you engage by identifying traits noted in others. What sets them apart from other board members? Based on the understanding of the behavioral patterns of each member of the board identified, analyze the board’s Business Chemistry composition, identifying relative strengths and areas of misalignment to understand how to use each individual’s natural tendencies, while leveraging the overall board to achieve goals. Consider the current board personality composition, including any uneven proportions to certain Business Chemistry type(s), to define gaps that may need to be filled through the board refreshment process. In considering the applicability of Business Chemistry to boards and committees, it's worth noting that diversity in traits and preferences may promote diversity of thought within the boardroom. Having and engaging a diverse set of personalities on the board will likely enhance the interaction in the boardroom. As board leaders and members begin to understand their own styles and the preferences of others, the interaction and style of board and committee meetings may shift as the group learns how to operate more effectively together. Finally, board structure and leadership are not susceptible to a one-size-fits-all approach. Business Chemistry can help boards whether they adopt a combined or separate chair-CEO approach. The board and board leader should strive to ensure an environment that encourages diverse critical thinking and values robust, innovative, strategic discussions to achieve a higher level of success, which may be better attained through an understanding of the diverse set of personalities on the board. Business Chemistry, in combination with a comprehensive skills matrix, can be an effective means of creating better functioning boards and board committees. Utilizing the Business Chemistry model as a tool with a traditional skills matrix may yield a better-rounded picture of a director's skills and business-relevant traits that would be of greater assistance than either approach on its own. Implementing a few of the basic principles of Business Chemistry may create an advantage in the boardroom where directors have a better understanding of how to communicate with each other, and build credibility and collegiality within their roles, which can create more effective engagement within the boardroom. Business Chemistry may create an advantage in the boardroom where directors have a better understanding of how to communicate with each other, and build credibility and collegiality within their roles, which can create more effective engagement within the boardroom.